Raccoons are easy to recognize, with a prominent black mask across the eyes, grizzled gray and black coat, and ringed tail. This native mammal inhabits woodlands and marshes in rural and urban areas throughout North America. Raccoons can be found in virtually any habitat, as long as water is nearby. Raccoons are omnivorous, feasting on frogs, small fish, crayfish, small mammals, birds, eggs, reptiles, insects, fruits, and nuts. In agricultural areas, raccoons commonly cause substantial damage when they feed on corn and fruit crops or kill poultry. In residential and other developed areas, raccoons are attracted to bird seed, garbage, pet foods, some garden crops, and fruits. They can damage lawns when feeding on insects and earthworms. Raccoons are nocturnal and relatively silent. They den for the winter in tree cavities, rock crevices, and brush piles. However, in developed areas they also will den in attics, chimneys, sheds, buildings, decks, and crawl spaces where they can threaten the health and safety of people and pets. 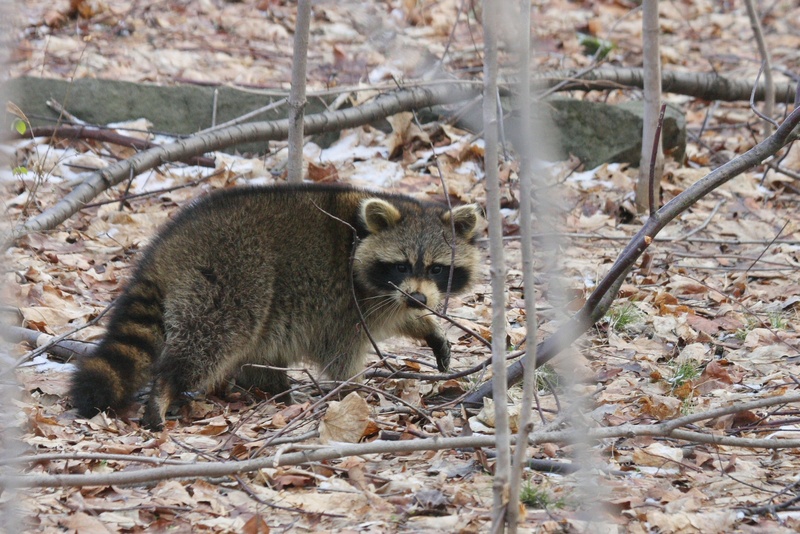 Raccoons carry rabies and raccoon roundworm. Breeding females give birth to an average of three to five cubs between April and July. Raccoon cubs are weaned in approximately two months, and quickly become active and capable of leaving the den. The young remain dependent on their mother throughout summer, becoming self-sufficient by fall. Nuisance control activity should take breeding seasons into account to prevent orphaning young.